When evaluating wireless backhaul technology, the possibility of radio frequency interference disrupting a wireless network link poses a concern. Radio interference results from unwanted radio frequency (RF) signals disrupting system communications. Typically these signals are at or near the same frequency as the receive frequency of an established wireless system. Interference can degrade a radio system's performance and in some cases even prevent the system from functioning at all. The source of interference is usually other transmitters that are very close in frequency to the impacted system. Interference can affect all types of radio frequencies, although the issue of interference in regards to outdoor wireless often occurs with license-exempt ("unlicensed wireless") systems operating in the 902-928MHz (spread spectrum), 2.4GHz, 5.3GHz, 5.4GHz, and 5.8GHz frequencies. Note: 60GHz millimeter wave, often used in gigabit wireles backhaul, is considered to be unlicensed but is extremely immune to interference due to its inherent features of having narrow beam widths and oxygen absorption over fairly short relative distance. 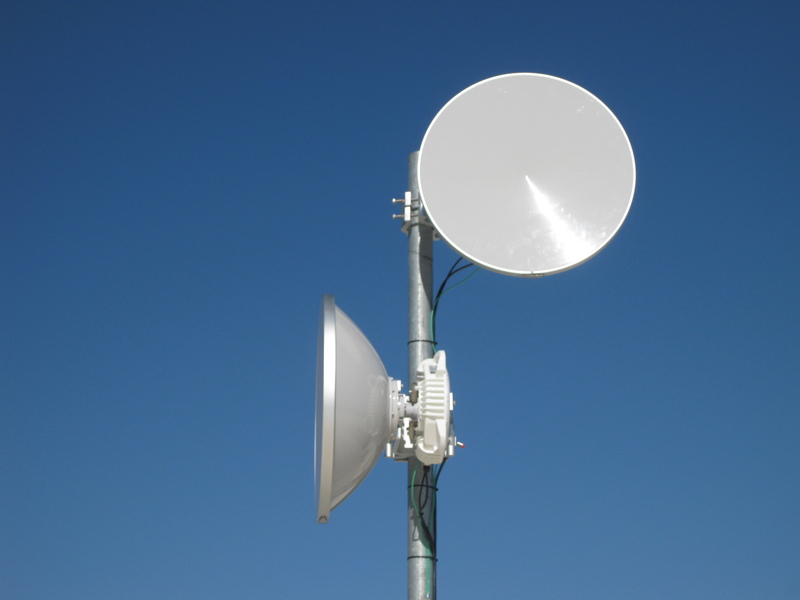 Point to point wireless links can be designed and deployed in either licensed microwave or un-licensed frequencies. Point to multipoint and mesh wireless systems typically operate in the un-licensed 2.4GHz, 5.3GHz, 5.4GHz, and 5.8GHz frequency bands. Some point to multipoint wireless systems can operate in licensed UHF/VHF, 900MHz, 3.65GHz (WiMax), and 4.9GHz (public safety) frequency bands. Note: There are licensed 2GHz bands owned by various telecommunication carriers being used for WiMax applications. The 4.9GHz public safety band is not truly a licensed band. It's a license registration that gives permission for use of the frequency among agencies that can prove that it's being used for public safety. Multiple agencies can be approved in the same operating area. The FCC states that the various agencies must self coordinate. They must work together on their operating channels to avoid interference, with each other, but provides no guaranty. Licensed RF transmitters communicate using a specific transmit and receive frequency combination that is selected and assigned to the user (licensee). Licensed microwave wireless systems operate within parts of the radio spectrum, such as: UHF/VHF, 900MHz, 2GHz, 3.65GHz (WiMax), 4.9GHz (public safety), 6GHz, 11GHz, 18GHz, 23GHz, and 80GHz (E-Band millimeter wave) as designated by the FCC. Licensed microwave wireless systems are becoming more popular as a result of noise interference in unlicensed wireless spectrum. Licensed microwave radios provide security from the risk of interference from other RF systems. In a licensed system the channels that the radio system transmits and receives on are owned by the user and are registered with the FCC for frequency coordination. Getting a license is inexpensive and can be obtained in the matter of weeks. Prior to deploying and operating a licensed frequency an end user is responsible for performing a frequency coordination, filing a public notice, and submitting an application (601 form) with the FCC to ensure that no one else is already operating on the same frequency or a frequency that will inject interference on existing systems. This process provides full disclosure of the frequency assignment and typically avoids interference from any existing licensee already assigned in the area. If licensed radios encounter interference, it is typically resolved with the assistance of the regulatory body. With un-licensed systems it can never be guaranteed that a system will operate interference free and with any predictable reliability. Many manufactured systems can help overcome interference by having a good carrier to interference ratio inherent with the hardware and by proper design and installation. With licensed microwave systems one can have a predictable reliability because of the lack of interference. Many licensed systems can be design and installed for 99.999% predictable reliability (meaning the system is predicted to have less than 5 min of outage time a year). The major difference between licensed wireless and license-exempt systems is that licensed radio users have a regulatory body that will assist them in overcoming any interference issues that may arise, while license-exempt users must resolve interference issues without governmental assistance.